View remembrances of our departed players on our Memorial Page. Club "Scouting Reports": 5 years, 2 years, 1 year, 6 months courtesy of cross-tables.com. Club Player since 2005. In addition to Scrabble, Adam likes to play video games (RPGs are favorite), post on his livejournal (at psyadam1.livejournal.com), and watch MSNBC politics. In addition to coming to club, Adam also coordinates the informal Wednesday "meet up" sessions at the Elysian Brewery. Founding Seattle Club Director and Director Emerita. She doesn't come to club much anymore, which makes us all sad. Joined club in May of 2005, and played first tournament in November of 2006 (vs. Vancouver match). First passion is cycling, logging about 3000 miles a year. Also enjoys photography, chess, and bridge. Our Statistician Emerita. First club appearance: June 1996. Started regular club play: August 1996. Shares with Dan Goodwin distinction for playing two triple-triples in one session (January 28, 1997). Only club member to have played in two National Scrabble Championships (U.S. and Canada) in 1998. Club player since 2007. Originally from Eastern Washington. Likes Ingmar Bergman movies. Teaches science and math to high school students. Has played in a few tournaments. Scored 593 in first club game. Club member since mid-2003. I played in my first tournament in Seattle in May 2004, placing 6th in Division 3. I placed 6th in Division 3 in Portland in September 2004 and 8th in Division 3 in Vancouver in March 2005. I have not played in enough tournaments to have a very high rating, but I have learned how to play competitively and look forward to better ratings and having more fun in the future. Thanks to my wife and daughter for patience and support with this hobby. Good luck to my fellow club members, ISC players, and future tournament challengers. And remember, it's just a game, don't let it take over your life! Plays on Sundays more than at club, but we hope she'll make the long trip in again some Tuesday. Long-time club member, but doesn't come much anymore. Joined the club in November 2005, and by January of 2006 stepped up to take over the weekly stats. He did the stats for over a year and a half, even when he couldn't make it to club. Thanks Doug! Although he lives in Tacoma, Geoff makes it to club occasionally. Travels extensively for tournaments. In addition to playing the game, George has been making custom (round and folding) boards for a few years now. Midori has been playing competitive Scrabble since 1994. Scrabble is one of the top passions in her life; she loves to learn new words which are unusual and strange looking. Jane passed the Director's test in 2006 and has been instrumental to the introduction and directing of one-day tournaments in Seattle since Feb 2007. Started playing Scrabble as a wee lad of about 8. Played in my first tourney (and won) in 1979 (Eureka, CA). 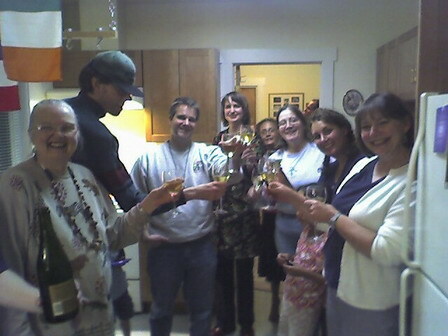 Have been active in the Seattle club since it was organized in 1985. Have played in many tourneys, won a few. Finished 20th at Nationals in 1988. Maybe best known in Scrabble circles for having devised the "Clark Pairing System" for round-robin pairings, or for having played a 15-letter word ("RECONSIDERATION") in tournament play. Mark started club and tourneys in 2005 and has been a regular ever since. Deadhead, video and online and live poker player, retired engineer, and Nigel's dad. Works in the hospitality industry, as needed, to support her obsessions with Scrabble and Burning Man. Club Director. Began attending club in the spring of 2000, took over as Director (from a grateful Ann Ferguson) in January 2001. Work and family keep Steven from coming to club as much, but he's still a threat! Tod had foresaken scrabble for massage therapy ( Earth Touch Bodyworks ), but now he comes back from time to time. Walker won the Mid-Cities Texas Worlds Qualifying tournament to earn his spot on the US Team at the World Scrabble Championship in Kuala Lumpur in 2003. Scrabble is just a sideline for this rockin' musician. Chris Schneider left Seattle in September of 2006 for a new job in Denver. Here is a photo (courtesy of George Bissonnette) from a farewell get together for Chris (where, of course we played Scrabble). Long-time Seattle Scrabble Club member Charlene Bishop passed away July 26th, 2012. Charlene was a regular at club and played in the first Seattle tournament in 1988. She was a lively addition to any Scrabble session, and she was instrumental in getting our club meeting space at FareStart Restaurant (next door to the Josephinum). Unfortunately, she was not able to attend club regularly after it moved to the University District, and her health declined. Long-time Seattle Scrabble Club Treasurer Toby (Thora) Cozens passed away the morning of December 22nd. Toby had been battling brain cancer for months and was able to stay in her own home until the last few weeks (she was assisted in maintaining her independence as long as possible by her very supportive family). In addition to being the Treasurer of the Seattle Scrabble Club, Toby also recorded game stats for every club session for years, and provided incomparable assistance at every Memorial Day Tournament. Toby also volunteered with several other organizations and libraries. Toby has been part of the Seattle Club from the very beginning--she became involved initially as the babysitter of club co-founder Mark Oppenheimer. She will be missed. Carl Barish (1941? - 2006) played a very sharp SCRABBLE game, and was a regular member of the Seattle Club for over 14 years. He loved to tinker with electronics and radios. Carl designed and sold his own line of digital Scrabble clocks (the 2Timer) that is still in use today at the Seattle Scrabble Club and elsewhere. He was also a member of a local Ham Radio club (his callsign: KC7ZK). Remembrances on our Memorial Page.